Pediatric Physical Therapy assists in early detection of health problems and uses a wide variety of modalities to treat disorders in the pediatric population. Pediatric Physical Therapist’s specialize in the diagnosis, treatment, and management of infants and children. The child’s pediatric physical therapy emphasizes rehabilitation or neuromuscular re-education of the total child with a focus on the development of core stability, lower extremity function and gross motor ability. Pediatric therapy specialists will provide general strength training (helping with low muscle tone), address gross motor planning delays while improving balance, coordination, mobility and posture necessary for a child to engage in daily activities, sports and recreational play. 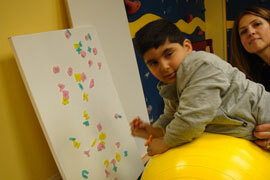 Education and involvement of the family is a primary consideration in a child’s progress during kids physical therapy.